Sriracha Hot Chili Sauce. Natural Color. The one and only original Sriracha Hot Sauce. Huy Fong Foods Sriracha Hot Chili Sauce is made from sun ripened chili peppers. 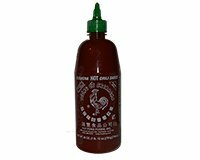 Sriracha Sauce is ready to use in soups, sauces, pasta, pizza, hot dogs, hamburgers, chow mein or on anything where you want to add a delicous spicy taste. Made in USA with California Produce. Ingredients: Chili, Sugar, Salt, Garlic, Distilled Vinegar, Potassium Sorbate, Contains Sodium Bisulfite As Preservatives and Xanthan Gum. Allergy Information: contains Sulfite (Sodium Bisulfite).